Arriving at the headwaters of Lemhi River, a company of Latter-Day Saint men who had been called to establish a mission among the Indians proceeded approximately 30 miles downstream, selected a site for a fort and a tract of farming land, On June 18, 1855, they dug a ditch, turned the water over the land, and after ploughing about 8 acres, planted corn, turnips, peas, beams and potatoes. 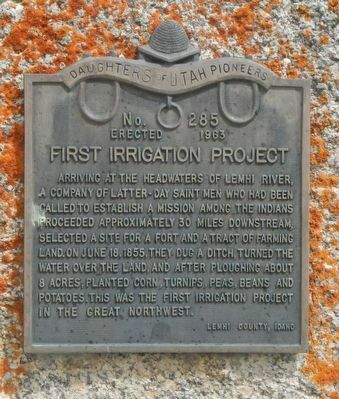 This was the first irrigation project in the Great Northwest. Location. 44° 58.985′ N, 113° 38.441′ W. Marker is in Tendoy, Idaho, in Lemhi County. Marker is at the intersection of Back Road (State Road 28) and Mule Shoe Road, on the left when traveling north on Back Road. Touch for map. Marker is in this post office area: Tendoy ID 83468, United States of America. Touch for directions. 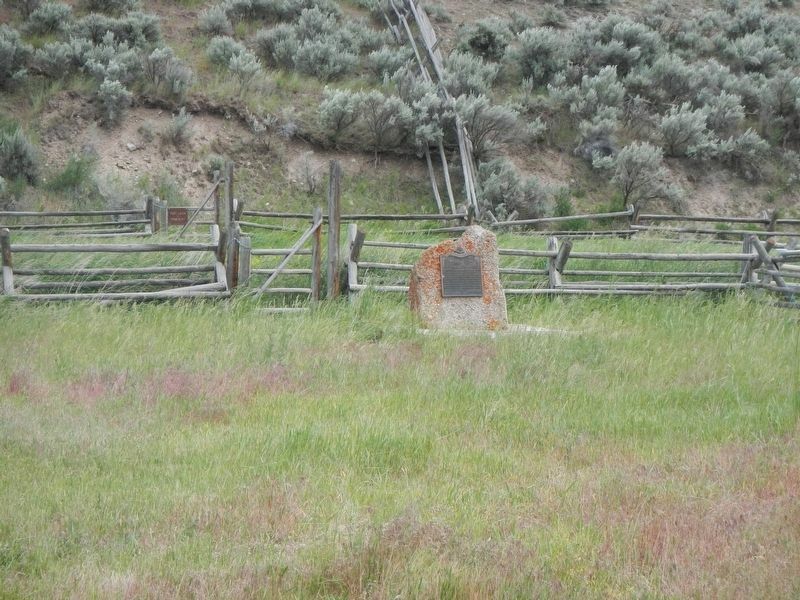 (within shouting distance of this marker); Fort Lemhi (approx. half a mile away); Sacajawea Comes Home (approx. 1½ miles away); The Withington Caldera (approx. 1½ miles away); William Clark's Scouting Mission (approx. 1½ miles away); Lewis Learns from the Lemhi Shoshone (approx. 1½ miles away); Meriwether Lewis Makes Contact (approx. 1½ miles away). Touch for a list and map of all markers in Tendoy. More about this marker. It may look like private property, but the entrance to the ranch is a continuation of Mule Shoe Road (according to Google Maps. More. Search the internet for First Irrigation Project. Credits. This page was last revised on September 23, 2018. This page originally submitted on September 23, 2018, by Barry Swackhamer of San Jose, California. This page has been viewed 43 times since then and 6 times this year. Photos: 1, 2. submitted on September 23, 2018, by Barry Swackhamer of San Jose, California.